One reason I love fall is pumpkin. I don't know what it is about the fall months, but everything just tastes better with pumpkin in it. I hope y'all are ready for some pumpkin recipes, because I'm about to go on a pumpkin baking and cooking spree! But don't worry, I'll try to throw in some non-pumpkin recipes to keep things interesting. Just considered yourself warned of the pumpkin overload coming to Cooking to Perfection. And what better way to start the pumpkin spree than with these Pumpkin Spice Cupcakes! These cupcakes are so fun to bake and even more fun to eat. 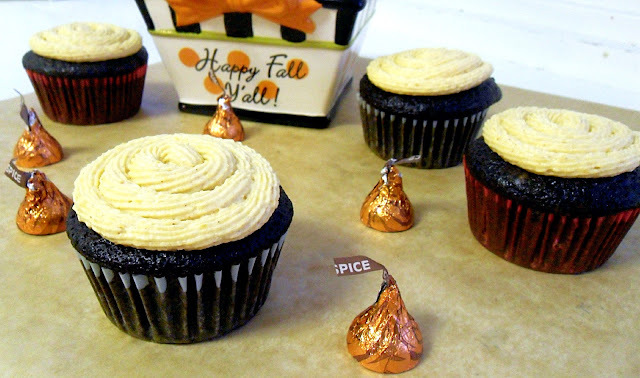 The little Pumpkin Spice Hershey Kiss hidden in each cupcake is one of the many details that make these cupcakes special. The chocolate cupcake recipe is one that I've used for years. It is one of the easiest and best cake recipes out there. The addition of coffee, in this case Starbucks VIA Ready Brew Pumpkin Spice coffee, adds a depth of flavor the makes these cupcakes even more rich than your average chocolate cake. I adjusted the original recipe slightly to make these gems a little healthier. And the great thing is that they taste exactly the same as the original recipe! Gotta love when you can eliminate a few calories without sacrificing flavor! And then there is the pumpkin buttercream frosting. 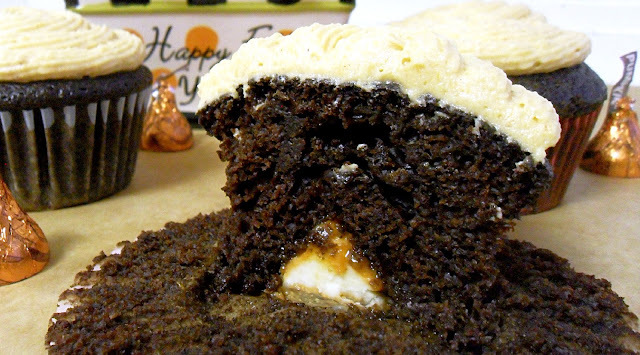 This buttercream has a slight pumpkin flavor that complements the cupcakes perfectly. I used a little bit of shortening in this recipe to help set the frosting so that it would hold it's shape after frosting the cupcakes. Also, because I wanted the pumpkin to shine through, I used shortening as a neutral flavored fat. If you want to have some fun in the kitchen and impress your family, make a batch of these divinely delicious, fall inspired cupcakes! Add the flour, sugar, cocoa powder, baking soda, baking powder, salt, and pumpkin pie spice to a large mixing bowl. Mix ingredients together. In a separate mixing bowl, add buttermilk, oil, applesauce, eggs, and vanilla extract. Whisk ingredients together. Add liquid ingredients to dry ingredients, and mix until just incorporated. Add the Starbucks VIA Ready Brew to the cup of hot water and stir until dissolved. Add to cake batter and mix until well incorporated. Pour cake batter into prepared muffin tin. 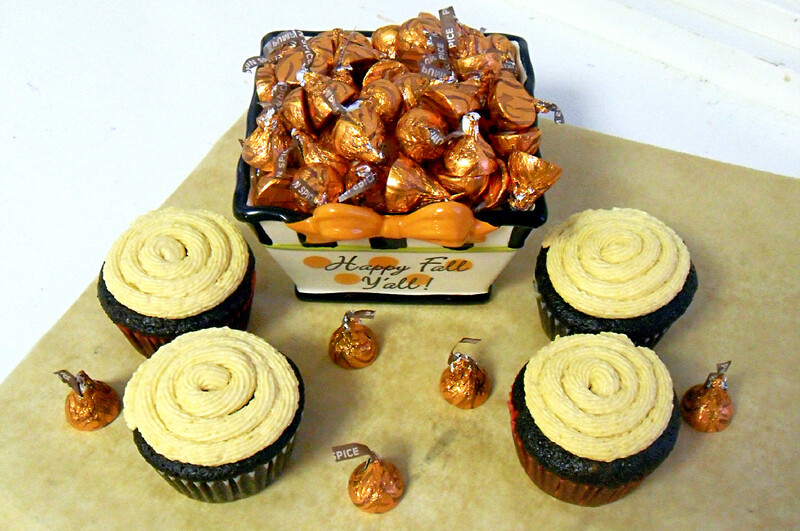 If using Hershey Kisses, unwrap candies and place one in the middle of each cupcake. Bake for 15 minutes, or until cakes are set. Cool cupcakes on a wire wrack; cool completely before frosting. To prepare the frosting, add the butter and shortening to the bowl of an electric mixer. Cream ingredients together. Add the pumpkin puree, salt, vanilla extract, and pumpkin pie spice and mix ingredients until well incorporated. Slowly add powdered sugar and mix until incorporated. Beat frosting for 1-2 minutes or until frosting is light and fluffy. Frost cooled cupcakes. *Using foil cupcake liners ensures that your cupcakes won't stick to the foil. You can use paper cupcake liners but your cupcakes might stick. If you use the Hershey Kisses, you will need to use foil liners. These sound delicious and I am going out to buy some hershey kisses and starbucks Via pumpkin spice so that I can make them this fall. Thanks for sharing on Foodie Friends Friday. It's always good to have Starbucks VIA Ready Brew Pumpkin Spice around; it's a great addition to so many recipes, and if you want a Pumpkin Spice Latte but don't feel live driving to Starbucks then you're set :) Thanks for clicking on my recipe at the link party! Elaine, what BEAUTIFUL frosting job here! The swirls look absolutely perfect. You have a steady hand! I have GOT to try those pumpkin spice kisses! i haven't had one yet! These look divine! I'd love to have one for dessert :) Thanks so much for sharing at Mix it up Monday! Thanks so much for linking up to Heavenly Treats Sunday! I am featuring these Yummy cupcakes, and I will be making these, just tweaking a little! That's great! Thank you so much for featuring them. I'm looking forward to seeing how yours turn out! I these look decadent. I love the addition of the kiss. Thanks for sharing on Foodie Friends Friday. Please come back Sunday to vote. I was at Starbucks and excited because they finally got more Pumpkin Spice Vias in.I overheard someone in line talking about cooking with the Pumpkin Spice Via. I did a search and found this wonderful recipe. Can't wait to make it. I've never seen the kisses, but ... I have been trying to stay out of the candy isle. Do you have more recipes using PS Via? I'd like to make a quick bread using it? But, I'm always afraid of throwing things together. I always need a recipe. Oh! You changed overnight!! Love the new look. Thanks for sharing these with me on my Birthday! Chobani Winner (and other Chobani stuff)!